http://www.vladtv.com - Brand Nubian rapper Lord Jamar explains why he doesn't feel that Macklemore deserved four Grammys, claiming he doesn't know any "real" hip-hop fans that own Macklemore's album. When asked about Ab-Soul and Schoolboy Q supporting Macklemore, Lord Jamar says "of course" they support it, because they've collaborated with the Seattle rapper. On the flip side, Jamar says that Eminem deserved his Grammys, because "he came up worshipping black emcees" and "did the study" of the hip-hop culture. 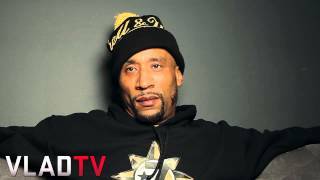 Lord Jamar speaks more about the Grammys, ... Lord Jamar: Macklemore Didn't Deserve 4 Grammys by djvlad 10 months ago . 190,657 views. Lord Jamar Says Macklemore Didn't Deserve His Four Grammys. Do you agree with Lord. ... Do you agree with Lord Jamar? Charlamagne Calls Yelawolf & MGK "Vanilla N*ggas"
Charlamagne: "Paula Couldn't Handle Robin's Success"